Tucked away on a back street in Geldeston about a mile away from Gillingham, Norfolk is the newly-restored former Garden House pub which has been converted into a two-bedroom private residence by the new owners. Everything had been renovated to the highest possible standard using local craftsmen and top-quality materials. 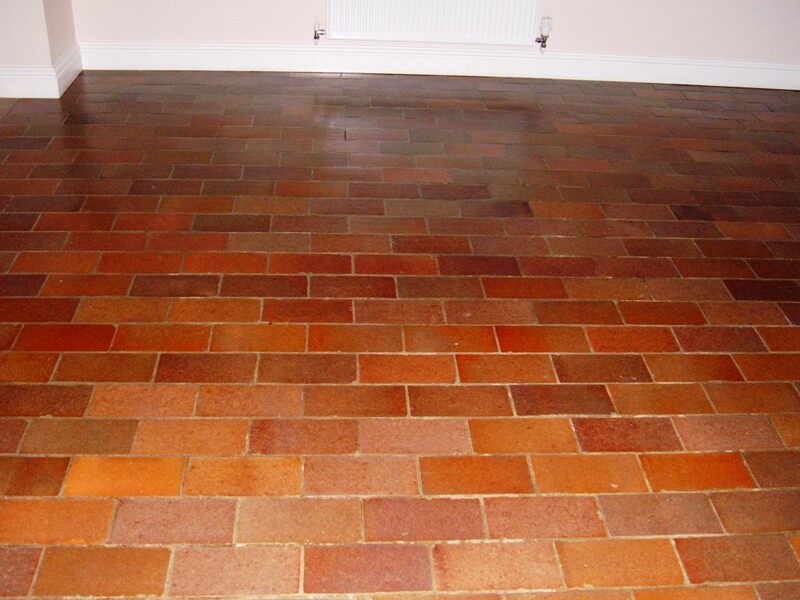 The last piece of this jigsaw was the renovation of the quarry tile flooring which was laid in a brick pattern and runs from the kitchen through the dining room and into the main entrance hall. As is often the case during major building works, the floor had been inadequately protected and consequently it had become completely coated in a combination of builder’s dust, plaster, paint and mud from the garden. As it’s such a large area it really needed some attention to get back its lustre. 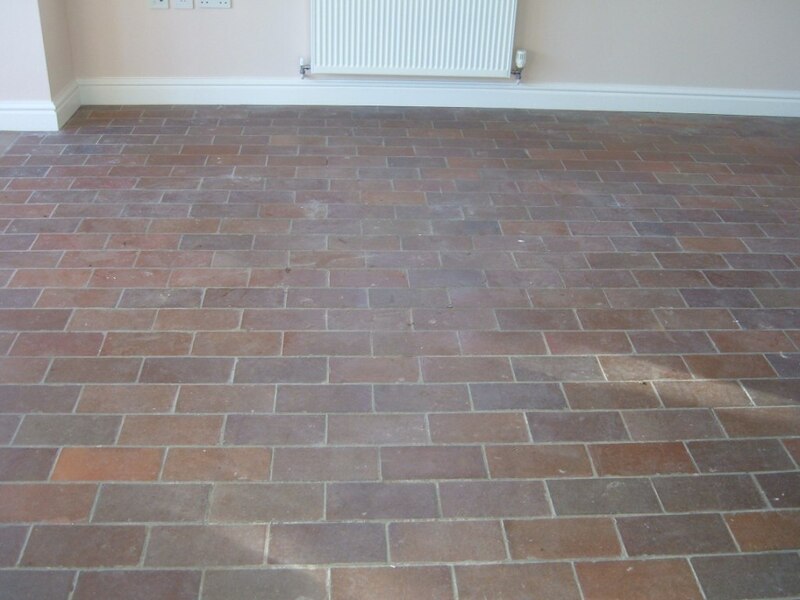 In order to prevent further scratching to the tile surface during the cleaning process our first job was to vacuum the whole area to pick up all the larger bits of debris and grit. 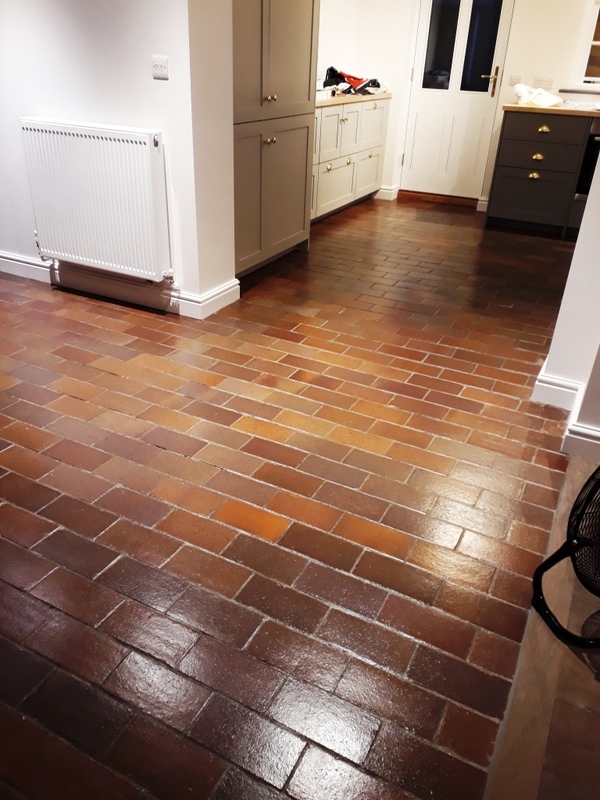 Next, the floor was deep-cleaned using a rotary machine fitted with a black scrubbing pad and a strong solution (1:3 ratio) of Tile Doctor Pro-Clean, our high pH combination stripper and cleaner which made short work of the top layer of dust and grime. Having power rinsed and vacuumed away the resulting slurry, we found that there were a large number of ground-in plaster spots and patches still remaining, which gave the floor an unsatisfactory white spotted appearance. These were removed using Tile Doctor Grout Clean-Up applied with a 6-inch black scrubbing pad fitted to our hand held DeWalt buffing machine, one of the most useful bits of kit in our tool bag! Great for attacking stubborn areas individually. The whole area was then allowed to dry with assistance from two industrial air movers. Returning a few days later, I checked the moisture levels in the floor which were satisfactory, so we were ready to move on to the finishing stage. My original intention had been to seal the grout lines alone with Tile Doctor Ultra-Seal, our no-sheen solvent based penetrating sealer, assuming that the tile surface was in a reasonably good condition. Unfortunately, owing to the age of the floor along with the abuse it had suffered during the building works, I found that the floor had a tired, pale look to it when completely dry. I decided, therefore, to seal and refinish it with four coats of Tile Doctor Seal & Go which both deepened and emphasized the colours within each individual tile and gave a pleasing mid-sheen to the whole area. It is lovely to have another satisfied client and great to add the finishing touches to their renovation.